Clear yellow flowers on tall stems make Narcissus henriquesii a good addition to the garden, and they do grow equally well in containers. The flowers are small, however last well and are fragrant with small cups that match the colour of the petals. With this small daffodil we suggest planting the bulbs closer together than the larger flowering Daffodils, a distance of around . 5 to 10 cm apart works for us. This gives us a mass display and the plants support each other as well. Best planted in full sun to a little afternoon shade. Dig the soil over well before planting and add a little well rotted compost. Plant the bulbs at around 10 – 15 cm deep. Dig and divide every 4 years. 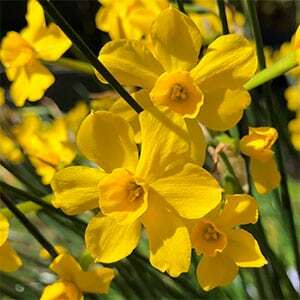 Botanical Name – Narcissus henriquesii or Narcissus jonquilla var. henriquesii. Common Name – Daffodil Henriquesii. Spread – Clump forming as bulbs multiply. Frost tolerant – Yes, in areas prone to very heavy frosts, mulch over the bulbs. Not readily available for sale at present.